Description: An arcade game that improves reaction time. 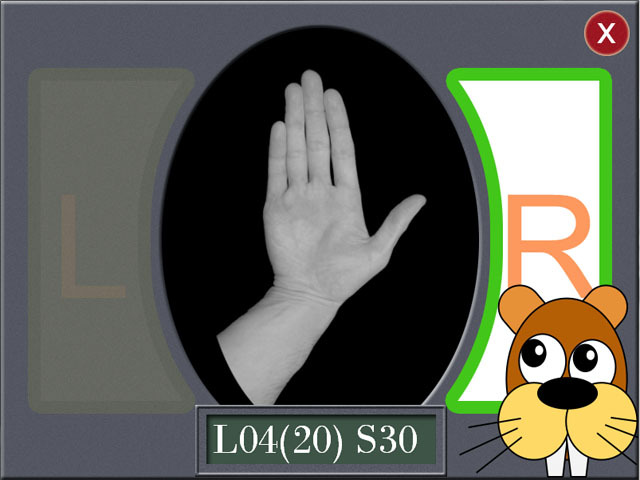 Hands are alternately displayed on the screen. We need to understand what kind of hand is displayed, left or right, and press the left or right mouse button. Correct clicks add one point, but get it wrong and you lose two points. Don't click in time and the hand will disappear and one point is deducted. Once 10 hands are displayed on the screen, the next level begins. A beep is heard and the speed of the showing of hands and the number of gestures will increase. A total of 20 levels of play, after which the final score is displayed. An arcade game that improves reaction time. Hands are alternately displayed on the screen. We need to understand what kind of hand is displayed, left or right, and press the left or right mouse button. Correct clicks add one point, but get it wrong and you lose two points. Don't click in time and the hand will disappear and one point is deducted. Once 10 hands are displayed on the screen, the next level begins. A beep is heard and the speed of the showing of hands and the number of gestures will increase. A total of 20 levels of play, after which the final score is displayed. An arcade game that improves reaction time. Hands are alternately displayed on the screen. We need to understand what kind of hand is displayed, left or right, and press the left or right mouse button. Correct clicks add one point, but get it wrong and you lose two points. Don't click in time and the hand will disappear and one point is deducted. Once 10 hands are displayed on the screen, the next level begins. A beep is heard and the speed of the showing of hands and the number of gestures will increase. A total of 20 levels of play, after which the final score is displayed. An arcade game that improves reaction time. Hands are alternately displayed on the screen. We need to understand what kind of hand is displayed, left or right, and press the left or right mouse button. Correct clicks add one point, but get it wrong and you lose two points. Don't click in time and the hand will disappear and one point is deducted. Once 10 hands are displayed on the screen, the next level begins.